Local brands such as Ecoalf in collaboration with Sybilla, Laura Escribano Atelier, Parallel Dimensions, SayPlease, Susana Nakatani, Sylvia Calvo BCN, Irema, Avasan, Yanapaqi, Sidikai, Monikako kids, Sepiia. Slow Fashion World runned a 10 day competition to select from 20+ brands that contributes to the United Nations’ Sustainable Development Goals. It is a pleasure to announce the winners from Monaco, Peru, India, Germany, France and Portugal. This time the selection was based on fairtrade, vegan designs and innovative textiles. The fashion designers will be exhibiting the selected design along with local designers from Jan. 23-30 at “Madrid es Moda” week. We will be highlighting their profiles via Instagram and our community! WHAT HAPPENS ON JANUARY 27? Exhibitions of selected fashion designers creating pieces for change. 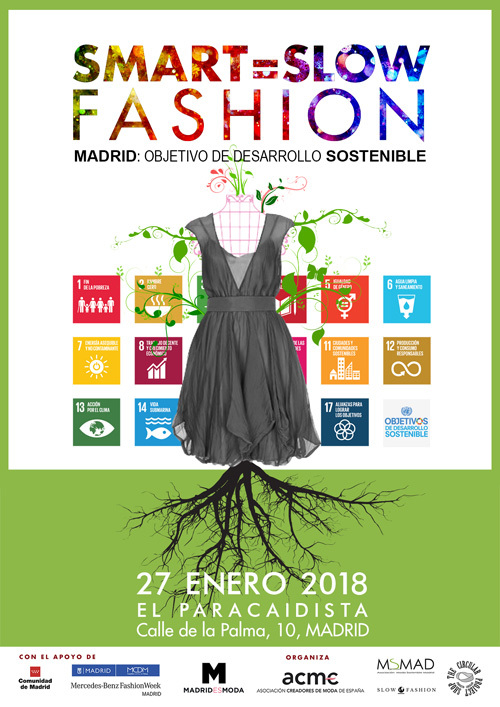 Meetings and conferences around the fashion industry, smart textiles and discussions around Smart Fashion and the role of fashion in achieving the SDG goals. Slow Fashion World founder Mariel Jumpa and Swedish SFW Changemaker will be having a presentation about Designing the future: Smart Fashion & Sustainability together Susana Nakatani. Come and join us! To see the full agenda and for details on how to attend, see here.